Thank you too! It’s a pleasure, for me! Your first album Ordinary Death Of Something Beautiful was released on June 22, 2012, through Logic(il)logic Records. Are you satisfied with the feedback you got from the fans and the press until now? We are so satisfied! We have a great feedback, from the fans, from the friends, from the press. We have three great reviews yet. And it’s only the beginning. You know, we didn’t know what to imagine about people’s reaction on this album. We tried to make something new, trying not to repeat what we did in the past in our first EP. And when you take a new “road”, you can’t imagine where this road will bring you. But right now we can say that the first reaction out of our world is beautiful! I´ve been listening to the album – it´s amazing, congratulation! Who wrote the songs for the CD? What are the lyrics about? Ehy! Thank you for your congratulations! 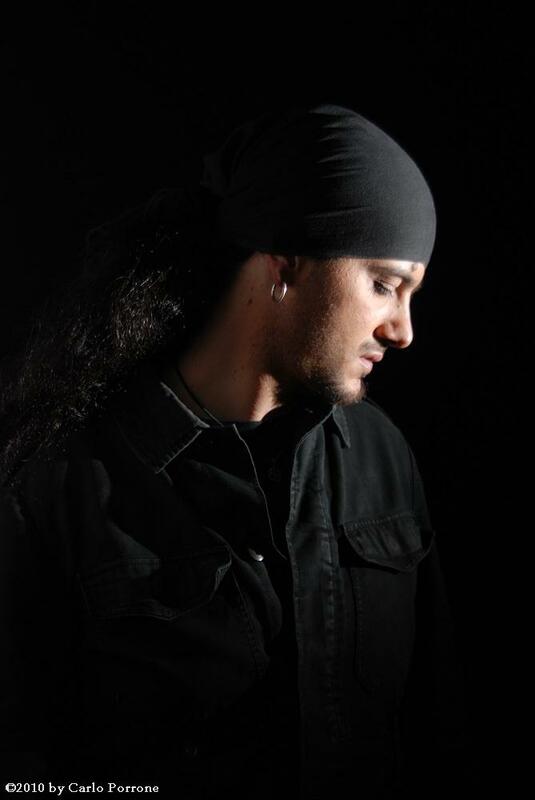 The most important composer for this album is Anselmo Zoccali (drummer). He had a lot of great ideas for the new songs. Then me. And of course the whole band worked hard on arrangements. 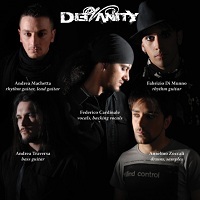 Andrea Machetta (guitarist) in particular, wrote most of the guitar riffs you can hear in the album. There are 11 great tracks and I know my favourites – are there one or more songs with a very special and deep meaning for you? Well, I love the entire album as you can imagine, but maybe my favourite song is Ordinary Death Of Something Beautiful... I feel that song inside me as the end of a journey made of dreams, fears, illusions, hopes, love, hate. It seems as the album summary, leaving you deep inside changed. There's a video for Soldiers, with a cool atmosphere which perfectly fits the song – it's very well done. Who had the idea for the clip and where did you film it? We are so happy for the video! We think it’s great! It’s our first videoclip, and we didn’t know what to expect, from this experience! We met these guys, from “Deus Ex Machina” studios. Their director is Sergio Luca Loreni. We liked him at the first time! We gave him the song, the artwork and the lyrics. And then he had the idea for the video. He wrote the storyboard all alone, and we left him this possibility, cause we trusted him at all, from the start. We filmed the clip in Chivasso, a little city not so far from Turin, our city, in a softair area. We had the luck to meet Sergio with his equipe, and to have in the clip Alessia Chiavarino, who made a perfect job with her character, as you can see, giving a great visual contest to our song. I think that in a videoclip you catch the goal if the music gives value to the images and the images give value to the song. Well, I think we got it at all! And the clip mirrors perfectly the song concept: in a conflictual relationship you fight against the other person... but often you’d have to realize in the end that you were fighting only against yourself and against the ghosts that you carry within yourself. Yes!!!! It’s a dream coming true! It was a long and hard job, and we worked trying to take care about every little particular, trying to not leaving anything to the fate. And right now, it’s really a dream listening to the album being completely satisfied for everything... For the sound, the songs, the artwork... everything! 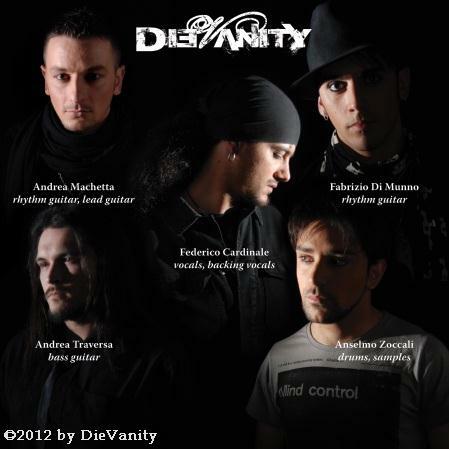 Could you please introduce the members of DieVanity and tell us a bit about the history of the band? OK! We have Andrea Machetta on rhythm and lead guitars, Fabrizio Di Munno on rhythm guitars, Andrea Traversa on the bass guitar, Anselmo Zoccali with drums, samples and programming, and then, of course, me, Federico Cardinale, with vocals and backing vocals. I started only with Andrea Machetta in 2006, with some home-recording songs. Some years later I met the other guys in another band... they listened to Curtains Fall demo saying that it was a great song! So we decided to continue all together, under DieVanity name (the first one was Dovetail). We recorded our first EP in 2010 and then we started playing live to promote our music. When we played as supporting act for Negative (a Finnish band we love), someone from logic(il)logic (our little-great label! ), got in touch with us. And so we started working on the first full-lenght. And here we are!! Well, we listen almost every kind of music! I think you can find spiritual inspiration in every musical genre. Starting from ’70 & ’80 Rock, through Pop, Metal, Death Metal, Gothic, Industrial. It’s hard to talk about roots, I start from ’80 New Wave, maybe, someone else in the band starts from Glam, someone else from Neoclassic Metal, someone else from Finnish Gothic, someone from Progressive Rock and Metal. We love a lot of different kinds of music!!! If you want some name I can say (but it is a little bit reductive), talking about actual bands, HIM, In Flames, Avenged Sevenfold, Linkin Park, Alter Bridge, Depeche Mode, Malmsteen, Rammstein, Dream Theater, Guns N’ Roses (the original line up, not the current), Slash. We don’t like boundaries!! It’s hard!! You know, when someone who doesn’t know what we are doing with music asks me to give some comparison to describe our music, I can’t answer! And I think that if we are not able to compare our band to other famous bands, it means that we reached a great goal: we were able to make something personal and original. I think our music is a strange mix of our influences, we have Gothic, but Pop too... Hard Rock but Industrial too... Glam but Progressive too. I´m very impressed by your voice. I´m honest: as I listened to Curtains Fall for the first time, I was a little bit confused - I thought Ville Valo from the Finnish band HIM is singing. You sounds very similar to Ville´s voice. Are such comparisons ok for your or don´t you like it at all? Oh, it’s not a problem... It is frequent, ahahahah! You have to believe me, I don’t try to copy Ville Valo. Yes, you’re right, my voice is similar to his voice, but it’s a coincidence. I had a HIM tribute, for this coincidence. And of course, I like HIM... but I didn’t realize immediately, when I listened Razorblade Romance for the first time, that my voice was similar (not identical) to Ville’s voice. A friend of mine told me that a few years ago: “hey! Your voice is similar to Ville Valo’s voice!”. And I realized that! But I try to do something different, and I think that our music is different. Of course, there’s some influence, but our music is different in many ways, I think. In which age you´ve started to sing in a band? I had my first band when I was 13 years old... But at that time I used to play drums. But I used to love singing so much, so my band decided to give me the opportunity to sing, in every concert, one song... only me and my acoustic guitar... and I used to make backing vocals, of course, while playing drums! I had the first band as a vocalist when I was 17. In the subsequent years I had many bands, sometimes as the singer, sometimes as the drummer. No, absolutely. We think that it’s not a good way to achieve success. If you don’t play what you feel inside, you can’t do a good job. When you play you try to show who you are. And you can’t pretend to be someone else, don’t ya think? Social networks like e.g. Facebook and Twitter are indispensable for bands nowadays. Do you see it as cool chance to get contact with your fans there and to read their opinions about your music? I think that social networks give a great opportunity to the bands. You can reach a lot of people in some minute. And you can read what they think about your music. Sometimes you can win some friendship. It’s an important mirror. But I think that social networks could represent a danger too, for the bands, cause internet is full of new bands, borning everyday. And it can happen that someone sees your band name thinkin “uff, another new band...!”. It’s easy, actually, to become very visible by internet, even if you don’t play good music. So the risk is that your band could be throw in the same great pelmet. Every kind of music, as always! In these days I’m mainly listening Sigur Ros (only when it’s dark), In Flames, Alter Bridge, Caparezza (an Italian artist), Coldplay, Tori Amos, Linkin Park, Shinedown... and, of course, DieVanity album! I’m so proud every time I listen Ordinary Death Of Something Beautiful! Next week, on 7th (July), we are going to present our album live for the first time! It will be our release party and our showcase at the same time. And we have a great opportunity, cause we will play on one of the bigger Italian summer stages, during “Colonia Sonora”, a big summer festival near Turin, where played, through the years, bands as Korn, Black Label Society, Deep Purple, Alice In Chains, Killswitch Engage, Lordi, Motörhead... and now DieVanity! Then we will rest for some weeks, we are working hard since January, and, as you can imagine, everyone of us has his job, out of the band. So we are so happy, but so tired too...! We need to stop, for some weeks. But during the summer we will think about autumn, planning the live activity, cause we think that a band could die, without live concerts. And, of course, cause we want to promote our album everywhere! And we will work to bring our music everywhere, when you are proud of your music you dream that all the world could listen your songs. We will work on that! If you have good questions, it’s easy to have a good interview... nothing to add! I only have to say thanks to everyone who will have the patience to read the entire interview... and of course, thank you to you too, Marion! Thanks for this interview. We wish you all the best and much success with the CD!!! Thank you for the interview, it was funny, I’m sincere!